Ah, Allen Say—yet another favorite picture book author and illustrator. He is best known and loved for his Caldecott Medal winner, Grandfather’s Journey. Say’s stories draw heavily from his own family background and childhood, which he shares in his mesmerizing illustrated autobiography, Drawing from Memory. As a child, he was shunned by his parents for following his dream of becoming an artist. 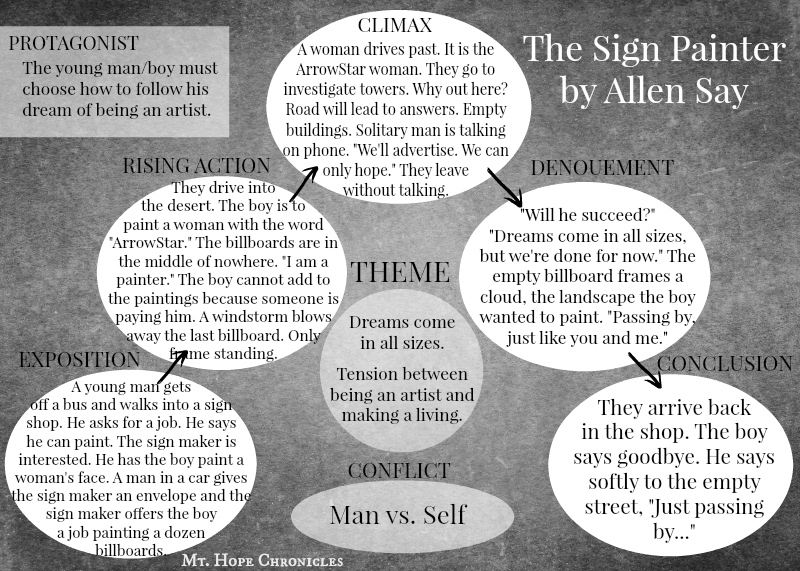 This artistic tension is felt in each of his stories but perhaps most of all in The Sign Painter. All of Allen Say’s picture books have a certain spare, quiet, mysterious, haunting, transient atmosphere, and The Sign Painter exhibits all of these qualities. Who is the boy, where did he come from, and how old is he? Who is the sign painter? Where are they? Where are all the people? Who is the man who has hired them? Who is the woman? What is ArrowStar? Who will see the billboards? What is that strange construction in the desert? What is the mysterious man’s dream and will he succeed? Where is the boy going next? And we wonder, does an artist sacrifice his dream when he must answer to another man? In Say’s books, characters often feel out of place, yearning for another home. In The Sign Painter we have the juxtaposition of two Japanese men in a remote Texas-like desert, billboards where no one will see them, a massive construction project (seemingly abandoned) where no one will travel, and a final scene from Edward Hopper’s famous painting Nighthawks (inspired by a diner in Manhattan). I’d love to have a discussion with older students about the placement of the Edward Hopper painting at the end of the book.